Description: southbound coming off the BNSF Fort Scott sub to the UP Coffeyville sub on the "Paola long track"
Description: KCS Westbound Freight Train departing KCS'S High Oak Yard in Pearl, Ms. Description: This work train was stashed in the siding at Stilwell, awaiting a Monday call to duty. Description: Work train in the siding. Description: NS Southbound Freight Train 339 (Birmingham, AL. to Meridian, MS.) passing through 64th Street in Woodlawn, AL. 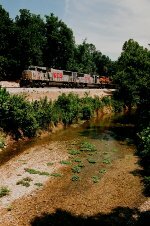 Description: NS Southbound Freight Train 339 (Birmingham, AL. to Meridian, MS.) passing through 35th Street in Birmingham, AL. Description: NS Southbound Freight Train 339 (Birmingham, AL. to Meridian, MS) passing through 35th Street in Birmingham, AL.